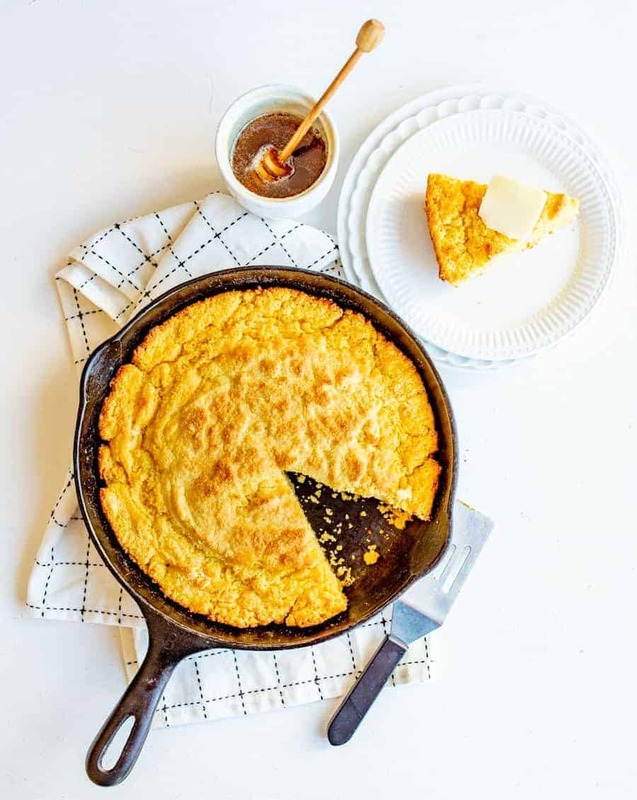 Cast Iron Skillet Cornbread that is tender in the middle, lightly sweet, and perfectly crusty on the bottom! I’m a huge cornbread lover and I make it all the time. I feel like it’s a super easy addition to dinner, it only takes about 5 minutes of hands-on time to prepare (and only 20-25 minutes in the oven which is fast for a bread), and my kids love it. So cornbread is for sure a win in my house and it accompanies soups, stews, and chilis all winter long. 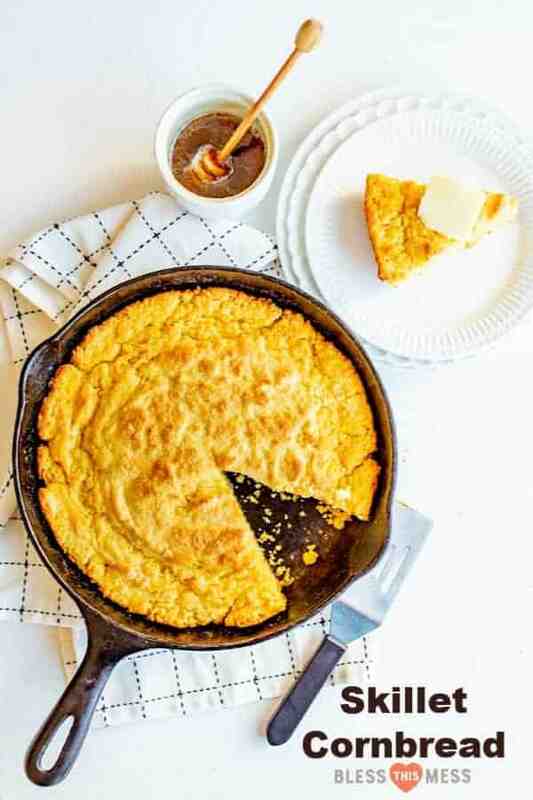 Skillet cornbread is special because of its crust. You add a little butter to the cast iron skillet and preheat it in the oven for a few minutes. The skillet heats up and the butter melts. Then you pull it from the oven and add the batter. 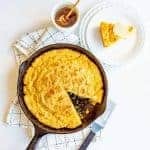 The magic of the hot skillet and the melted butter makes the delicious crispy crust on the bottom of the cornbread while the middle is still tender and light. I love this! It’s the perfect crispy layer of cornbread to stir into your bowl of soup or chili. 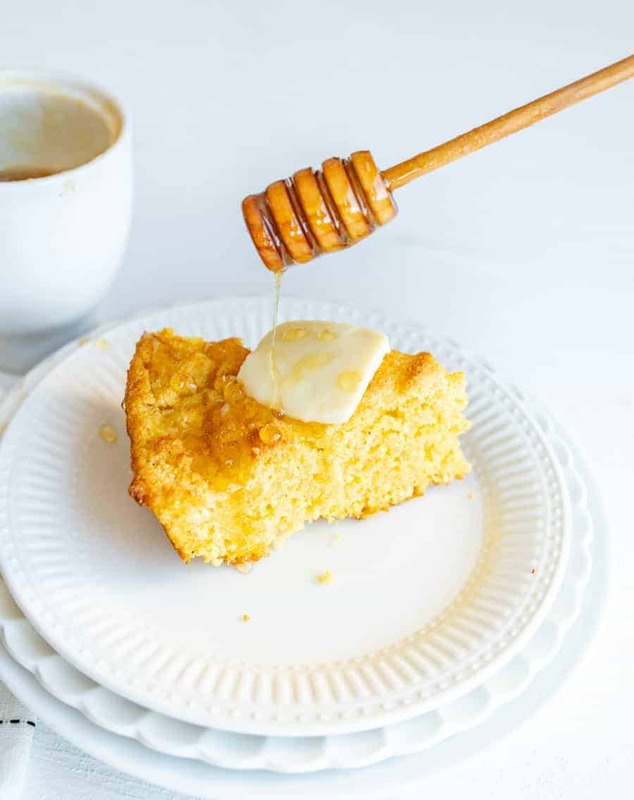 This is one of my favorite cornbread recipes because not only does it taste great and have that perfect crust on the bottom, but it looks great, too. Any dish served out of a cast iron skillet looks so great in my book! Impressive and easy, so it’s good enough to serve to company. I can’t wait for you to try this recipe. Use yellow cornmeal in this recipe. White works fine, but it just doesn’t look the same. 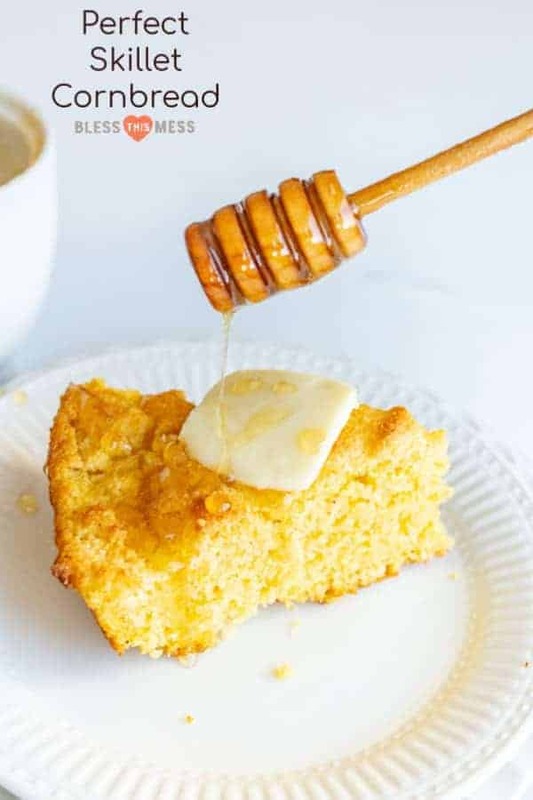 Golden yellow cornbread is a must. Also, don’t try to sub any of the cornmeals used for making tamales – they are a different grind and the texture doesn’t come out the same. How fun is it cooked in the cast iron pan? Just grease it and cook it in cast iron like you would any other pan. I think you need one. I have made this recipe gluten free by simply swapping out the all-purpose flour for a gluten-free baking blend and it worked perfectly. How do I store leftover cornbread? I like to store leftover cornbread covered with a towel, in the skillet, on the counter for up to 2 days. Then pop the skillet into a 350 degree oven for a few minutes to reheat it. Can cornbread be made ahead of time? This recipe can be made up to a day ahead of time. Simply cover with a towel once it has cooled to room temperature. Feel free to reheat the next day as directed above. The crust won’t be quite as crisp but it still reheats well. Can I freeze this skillet cornbread recipe? Yes! Just store in an air-tight freezer safe container once the cornbread has cooled to room temperature. Pop the container in the freezer for up to a month. Thaw in the fridge overnight and then refresh in the oven as directed above. In a medium bowl, mix the flour, cornmeal, sugar, baking powder, baking soda, and salt together until well combined. Make a well in the center of the dry ingredients and add the buttermilk and egg. Slow mix the ingredients until everything comes together, taking care not to over mix. Add the 4 tablespoons of butter to a 10-inch cast iron skillet and place it in the oven. Let the butter melt in the pan for 3-5 minutes. When the butter is melted, remove the pan from the oven and carefully swirl the butter in the pan to evenly coat the bottom. Add the prepared batter to the prepared pan and smooth the top with a spatula. Bake for 20-25 minutes or until the top is golden brown and the cornbread is cooked through. Remove from the oven and allow to cool for 5 minutes before cutting and serving hot. I have made this recipe gluten free by simple swapping out the all-purpose flour for a gluten-free baking blend and it worked perfectly. So much to love about this great recipe! I hope that you make it over and over again like we do and serve it with all of your favorite soups, stews, and chilis this winter. Enjoy from my kitchen to yours!